News TV Channel / Live broadcasts, video and news about protest activity in Armenia every day. Various political and civil groups led by member of parliament Nikol Pashinyan (head of Civil Contract party) staged anti-government protests in Armenia in April 2018. 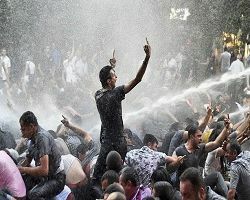 Protests and marches took place initially in response to Serzh Sargsyan's third consecutive term as the most powerful figure in the government of the Armenia, and later against the Republican Party-controlled government in general. Pashinyan declared it a Velvet Revolution. On 23 April, Sargsyan conceded, saying "I was wrong, while Nikol Pashinyan was right" and resigned. The event is referred to by some as a peaceful revolution akin to revolutions in other post-Soviet states. By the evening of 25 April the Republican Party’s coalition partner ARF-Dashnaktsutyun had withdrawn from the coalition, which means that in order for an opposition candidate to be elected Prime Minister by the National Assembly, it would be necessary for six Republican members of parliament to vote against the party line. Voting to elect the new Prime Minister will take place on 1 May.